The Diocese of Richmond’s McMahon Parater Scholarship Foundation (MPSF) is approved to participate in the Virginia Education Improvement Scholarships Tax Credits (EISTC) program which provides scholarship assistance to low and middle income students who attend Peninsula Catholic. 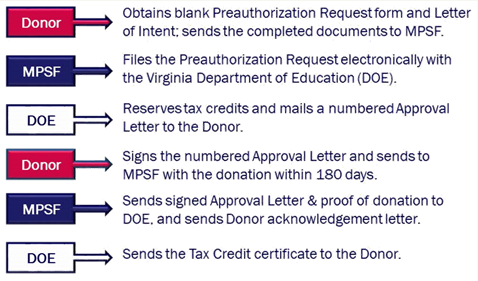 Individuals and businesses making contributions to the EISTC program will receive a Virginia state tax credit equal to 65% of the donation, in addition to the federal and state deduction for charitable gifts on itemized returns. The minimum donation is $500. Donations may be monetary or marketable securities. Monetary donations are payable through cash, check or credit and may be paid in one payment or installments. Credits can be applied to the current year’s return or carried over for up to five years. Please consult your tax advisor for your specific tax savings. For example, this taxpayer has state and local income taxes in excess of $10,000 after subtracting the 65% EISTC state income tax credit. 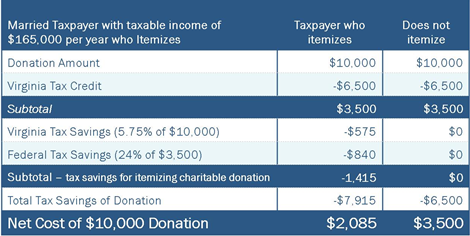 The savings is significant for taxpayers who itemize and those who do not itemize their tax returns. The process to participate in the EISTC program is indicated below. For more information, contact the Development Office.